15th Annual Nelson’s Ride T-Shirts! 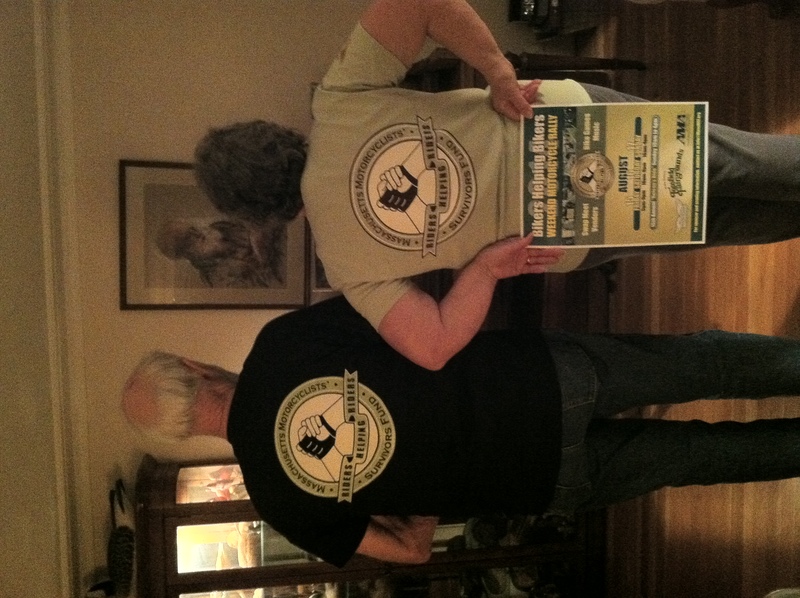 Faye and Bob Brophy, Nelson’s parents, are proudly wearing their new 15th Annual Nelson’s Ride Event T-Shirts! This entry was posted in Events, Photos, Supporters and tagged 15th annual nelson's ride, aug 15-17 2014, event shirts, faye and bob brophy, nelson, t-shirts on March 7, 2014 by mmsf. This Saturday and Sunday March 8th and March 9th, the Northeast Motorcycle Expo will be in Wilmington, MA, and BikersHelpingBikers will be there, too! Parking is FREE, and you can print the coupon (below) for $2 off admission. Come see us at our booth for season long 50/50 Raffle tickets, flyers for all upcoming supporting clubs/groups Rides and Events, T’s Ride, Bikers Helping Bikers Weekend Motorcycle Rally & 15th annual Nelson’s Ride, free ‘check twice’ sticca’s. Join us! This entry was posted in Uncategorized on March 4, 2014 by mmsf. This February’s Turkey Shoot Hot Shots were “The Firecrackers” (with Pat McFarline, Valerie Marshall, Deanna Ouderkerken and Jan Sonia from the North Shore Women on Wheels). The title of “Top Shot of the Night” goes to Deanna Ouderkerken (second from left). Congratulations to Deanna and to The Firecrackers! More photos from the night’s festivities can be found here (thanks to Marie Hanabusa)! Our final MMSF “Turkey Shoot” of the 2013-2014 season will take place on Friday, March 28th, 2014. Find out more about the event, and join us! This entry was posted in Uncategorized and tagged air soft special ops, february 2014, hot shots, nswow, salisbury, turkey shoot, winners circle on March 3, 2014 by mmsf.